This is called "Things I'm afraid to tell you" for a reason- its a hard post to write. Hard things are about to be said. 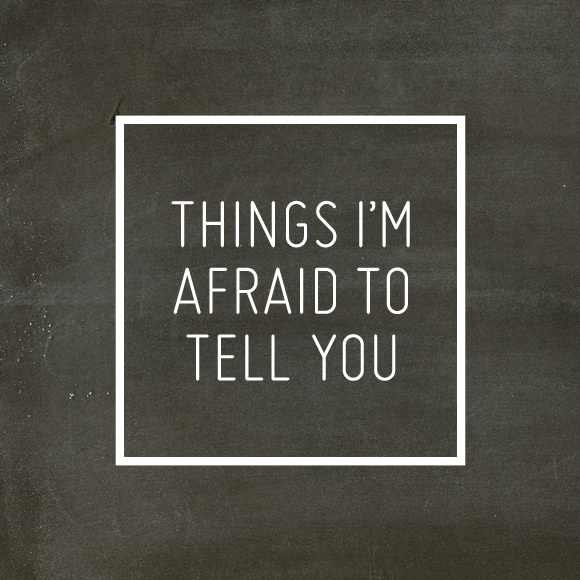 Things I'm...afraid to tell you. Things I'm scared will push you away or worse- have you not like me. My true opinion of the blogging world. I have a lot to say right now...but I guess in a way I don't know how to get it all out. It's like trying to shove peanut butter through the tiniest pin hole. It just doesn't work! Let me first say- my intentions are not to offend a single person- not even a fly. In fact a part of me says "stay safe" and forget posting this altogether. But another part says I need to be honest, open, and real with you all. I would like, really, to talk to you all about some things that have been swirling my brain for some time now. I hope no one will be sad or angry after reading- I'm afraid of that. I guess I'll start off with applauding a few blogs I read on their whole hearted honesty. That's what, essentially, inspired this blog post. This last week in between filling orders and writing my own blog posts, I had some time to "try to" catch up on my fav blogs. Three in particular really just spoke to me: Hank and Hunt, Creature Comforts, and CAKE's "Things I'm Afraid to Tell You". Actually, I guess it's a whole blog-movement thing going around right now- there's a LOT of blogs doing the same thing (ones I'm sad to say I don't personally follow...yet). If you're interested in reading their stories, please click here. Each blog that has agreed to participate has written a post all about the things they've been mulling around in their wonderful brains, but not yet had the courage to share with their readers. The blogs I've personally read so far have been explaining and confessing about how utterly life consuming doing their particular blog is. How tiring it is, how thankless it's become and how they're (in some cases) tired of the competition that has all of a sudden become a part of the blogging world. Not only that, but how the loved ones around them don't see what they're doing as a "real job". They kind of snort at the fact that blogging is a job and don't believe that someone must actually work at it to keep it going. They talk about how their friends feel like they just don't want to hang out, when they say "I have to work" in response to blogging. The blogs I've read speak about their upcoming plans- how they're either going back to posting personal DIYs and things going on around them, posting every now and then...or (sadly) stopping their blog altogether. The blogging world has gotten way too competitive. Like, totes. The blogging world has pulled away from the sort of "mom and pop" feel I think blogs should really be about. They've become less about the person's personal life, hobbies, art and loves and more about keeping up with the Jones's. Let's be real for a second...blogs (I'm not talking websites...I'm talking blogs) were started as and essentially are public diaries. So you, the blog author, are really just publicly documenting the fun things you've done or made and you're hoping other people will like those things so much that they'll "follow you". On a bigger scale, one day you, the blog author, are hoping that people will love your public diary of neat things so much that they want to advertise their blogs on your blog and try to attract your followers as well. And that's how you make money blogging. In my very humbled opinion this is what a blog should be- an intimate place for someone to document things they love and love doing. The end. It shouldn't be a place where competition exists- it shouldn't be about "Who's blog is better"...it's YOUR blog...YOUR blog is the best! :) Semi kidding there. Blogs should be a place to feel at home and get inspired by other moms (or dads) or people who are in your same shoes with your same interests. It should be a place to meet someone new, click and become friends, and share in each other's smiles (and sometimes tears). Blogs should be intimately inspiring. The end. The thing is... instead of being a place to share one's personal craft idea or some awesome DIY we've done and think you'd like to do too, some yummy recipe we wrote or tried...it's become this weird place of commercialism and money. Sure, making money from my blog would be TOTALLY nice- do not get me wrong here...and I hope to actually do so in the future via other blog sponsors. I do offer other blogs this option of advertising their blog on my blog. Blog blog blog. Blog. But what I'm saying is- when did big businesses take over the blogging world? Their huge crazy expensive "DIY" is now being written about- you know...the DIY you can't afford, don't have the space to create, don't have the time to devote to because you have little ones running around? Don't read me wrong here- I'm not talking about a "big" business sending you their product to try, review, write about and such either- that's also awesome! Because YOU are still doing the work (maybe writing the recipe? ), YOU are still taking the pictures, YOU are still writing the blog ;) You're still a mom and pop- you just got noticed by some big guy. Same with featuring another mom and pop blog- maybe even having them "guest blog" on your blog- super cool! DO it! Support one another! And shoot- guest blog and be featured on theirs as well! It's the other blogs I'm talking about- the ones that feel like the original author/creator isn't even the one writing the blog anymore. It's become so heavily saturated with crazy big companies that that mom and pop feel has been lost. Sadly, those are the blogs that get the most views. Those are the blogs people are reading. It totally makes all the little "mom and pop" blogs fall totally short...and look lame-skis. Think of it this way...it's like getting your spouse a neat little unique homemade gift from Etsy- you know, from that little shop owner trying real hard to make a buck making things from the heart- for you to buy...versus running to said giant department store to buy some factory made thing. Ya hear what I'm saying? Blogs should be fun. Hard work, yes...but fun. First of all, because this blogging world has become so competitive, bloggers have to constantly keep up (which means research) with the latest trends. What's hot right now, type of stuff. What foods are big right now? What type of dessert are people making? What colors do people want to see more of? What wedding trends are people wanting at their wedding? What type of crafts are people looking to make? What holiday is coming up!?!!? Blogging is a full time job. Yes job. Money or not. A JOB. But honestly, a super fun job ;) Don't let anyone tell you otherwise. Bloggers are constantly being pushed to their mental, creative, and sometimes most of the time, physical limits. Sometimes this is on a daily basis! Blogging can sometimes be a thankless job. One you do more for yourself. One you do because you find it fun. More of a hobby. Bloggers' friends rarely understand these facts. People will scoff or snort at the sentence "I'm a _______ blogger" (fill in blank: food, wedding, craft) if asking "And what do you do for work?" This happens ALL the time to me. Most friends and family won't ask you how your blog is going. Most friends and family won't even follow your blog. Most friends and family won't even know you had one. Even though you've tried to get them to read and follow you...multiple times. Blogging most likely will only make you pocket change. BUT blogging is addictive. It's the best and most fun "club" to be a part of ;) I've made some pretty awesome blog friends through blogging. I guess what I'm saying is...blogging is the hardest thing I've done yet. It's just genuinely hard work. For one blog of mine, I have to think of the thing (or get inspired from research), make the thing, photograph the thing, photograph it well!, edit those photos, edit them well, edit them so you find them pleasing to the eye, post those pictures, write about the thing, write in a way that's fun, honest, easy to follow, and for the most part- grammatically correct. For one blog. One that you might just look at for 2.5 seconds and move on. Which is totally ok- we bloggers don't expect to please everyone. But at least now you know how much work we do. What I'm also needing to say is- I'm sad that friends and family of bloggers don't support, encourage, and just plain love on their blogging friends' choice of work (myself included). The lack of support is almost suffocating at times. Love your blog friend! Ask her (or him) how it's going! Read her blog! Not everyday necessarily...but shoot every now and then would be nice. Follow her blog- like sign up and click that little thing over there to the right ;) Comment on her blog every now and then, like her post, retweet her tweet...something. Show her you care. We need this encouragement from our real life friends and family. Most importantly, blogging is the most fun thing to be a part of. Where else can you get inspired, keep your creative juices flowing, make pretty (or yummy things), write about them and share with people all over the world? Then, when you get a comment on that blog post?! OH HEAVENS that's just the best. It's like Christmas- someone read your post! Someone looked at your pictures! Someone liked what you did! That's the best reward. Where else can you make friends all over the planet and join together via the internet to share in each others' lives? Then to get other blogs wanting to sponsor you??? Shoot. Like, the best ever. Because now your hobby is making you some laundry money. I'm so happy these blogs are courageous enough to post their honest feelings. In a way, I'm happy to read that they're having a hard time doing their blog- that they're struggling the same way I am...because it makes them more real to me. Because I am having a hard time with my blog too. I'm struggling with finding the encouragement to keep my blogging dream alive. I'm sad that the very essence of blogging is becoming a lost concept and that the very thing that allured us to blogging is now driving people away. I'm sad to see my favorite blogs debating leaving the blogging world- but this is for purely selfish reasons- I like reading what they have to say. But I have hope that when other people and bloggers read these posts and see what's going on- that a change might ignite. I hope that we can start to shy away from commercialism and stick more to the "mom and pop" feel. Sure, make some money blogging! Make a lot of money! I hope you do! Get people to love you and want to pay to be on your blog!! Have little ads in hopes you can make a little extra cash, I know I do. It is YOUR blog anyway and shoot you need to make money in order to live (and keep your blog going). More power to that, friend! Get lots of followers too! I hope everyone who reads this reaches a point where their blog is being viewed thousands of times a day! BUT don't lose yourself in doing so. Don't stop showing your messy house and screaming kids. Don't stop telling us about your bad day or insecurities you may be having at that moment. Don't stop showing us your 65 layer cake you made for your sister's wedding. Or a DIY on that table you scored from your latest trip to the swap meet that you yourself sanded, repainted, and made your own. Shoot! Feature a family member or friend's artsy talents! We love seeing those things too. JUST DON'T LOSE YOURSELF. The always-nice that we see on constant display everywhere we look (from blogs to magazines, etc) becomes frustrating because it doesn't really look like how our life looks, right? Instead of visiting a blog and feeling inspired, we quite often leave feeling less than, and like our life can never really match up to what we see. As a long-time contributor to this trend of pretty-everything I should know better, but even I get sucked up in feeling like other bloggers are more successful, have better wardrobes, perfectly behaved children, gourmet meals pre-made weeks in advance…they host fabulous parties with every last detail glittered and festooned to perfection, take lavish vacations, sign book deals in their sleep and pose for photo shoots in their immaculately clean designer-decorated homes. Most importantly I want people to start having fun blogging again. It's what it's supposed to be- fun. Sure it's work- but work can be fun right? Don't lose sleep over your blog. Be inspired with your blog. Don't lose time with your husband and babies. Work when you can (maybe during nap time?) Spend as much time as your life permits, and nothing more. Don't compare yourselves to the other blogs out there (speaking to myself big time here). Don't think yourself less than them. Instead look at others' and be inspired. I guess that goes in life as well...but that's a whole other blog post for another day. Showcase yourself and your friends! Showcase what a neat person you are or what super neat deal you just scored! Show your followers that you're just like them. Be personable. Be identifiable. Be real. Great post. You're totally right about the competitive nature of blogs and I find the same feeling on Twitter. WOW... I feel like I have so much to say about this. I'm just thankful you and others are talking about this crazy blog world. When I first started blogging it was just for fun. Little snippets of my single life. Most people had no idea what a blog was! All my readers were a handful of family and friends. Overtime I decided to be more proactive on my blog, mostly because now that I stay at home, I have time and want to feel like I'm doing something worthwhile with my time. So i put a lot of time and effort into my blog, more DIY projects, linking up, gaining followers. And it was fun until it wasn't. I don't know what I'm trying to say, but i just feel like I want to put less effort into my blog these days. It's tough work and very few people care. But I'm just going to keep on blogging and doing my thing, and enjoy and treasure my blogger friends who "get it" and are supportive. "Just keep doing what you enjoy, the people who like what you do will gravitate to you and you'll both be enriched by having each other." I'm so sorry you're feeling that neglect. It's a totally lame place to be. (Yes that was my husband- he is SO wise). It's true though- blogging is something you kind of have to do because YOU love it. Don't get demotivated if no one reads- it can happen! Just blog because you love blogging. Blog about what you want to blog about- and you will eventually find people who feel the same way and support you. BUT yes, I wish more of our friends and family around us would be a tad more supportive...it would makes things a heck of a lot more fun! :) BUT I also get it- blogging isn't for everyone. So I'm not referring to the friends who are so busy with their kids they can barely go online at all, let alone my blog. I was referring to my heavy internet savvy friends. Bottom line- if you have a blogging friend- ask her how it's going every so often. The end. PS- I love your blog...it's incredibly inspiring. Well stated and oh so true! My favorite posts are always the 'real' ones. :) There's something very...just personable when a blogger is comfortable enough to be real. I absolutely LOVE this Christina! This post is AMAZING and so inspiring. I have two friends that "get" it that aren't already bloggers, and they are worth their weight in gold. I try explaining to people and family it is like a magazine and you get to edit your content any way you like. Most people just don't get it. So, so, so much work goes into making each post and thank you for saying it. I don't think readers realize it and I don't think other bloggers realize how much time it takes everyone. It takes so much work that I rarely have enough time to read let alone comment on beautiful blogs. I am making an effort to do so more. Thank you. OH SHOOT! I kind of feel awestruck right now. I replied to your comment not knowing who you were, and then right after was curious to see what kind of blogger you were. So I clicked on your name- HOLY MOLY! You have no idea how much that means to me to hear you say the things you did. I've been a follower of yours for such a long time now! I love your stuff! (By the way...you're one of the ones I was referring to when I said to please not stop blogging)! ...Seriously, please dont stop. It's a hard business to be in...but also one of the more rewarding ones I've been fortunate to participate in. Thank you for taking the time to comment. That's another thing I wanted to write about- but decided I was already wordy enough....comment on each other's blogs. We're all in this same non-competitive family...and we should spread the love more and more. Even if it's just a "this is great!" comment- Comments really are the best thing to receive as a blogger. I appreciate you Jenny! Keep up the good work! This post hits home. I remember reading Cake's post the other day and thinking so true. I remember awhile back thinking the blog market is just so saturated why bother. My husband reminded me, that is not your motivation. You were never looking to compete. I started a blog to write about my dessert adventures and raise awareness for our farm we are building the Sudan. I appreciate this post and I am glad you are not scared to share your thoughts. So glad you found me on instagram so I could find your blog. :-) I appreciate it. Thanks for being courageous enough to post this~ I think more people feel the same way and just as your title says "they are afraid to tell you"
I am pretty new to blogging and I don't think I am very good at it but I think that's the problem. Feeling like you post has to be AMAZING to warrant any attention or be worth reading. Truthfully it is the real day to day posts that ARE amazing! For me the worst thing is no replies, no likes...not even any indication it has been read :( It feels like a personal slam. I have to admit I have been guilty of reading many posts on Blogs and never replying or liking either. I will definitely be changing that! Thanks for all the positive feedback my sweet friends! Thank you so much for commenting on my blog today and showing me this series. Talk about good timing...so relevant for me right now. I'm going to reach each one of these that bloggers have posted. I truly appreciated your post, very honest and well-written and true! You are SO welcome Jenna! I am a long time follower of your blog and just want you to know we bloggers feel ya! I hope you left here feeling encouraged. Don't give up, post what you'd like- and remember, those that love ya and can identify with you will always stick around!